It’s tough being a normal teenager with superpowers. That’s why Marinette Dupain-Cheng aka The miraculous Ladybug needs your help in defeating the evil Hawk Moth! 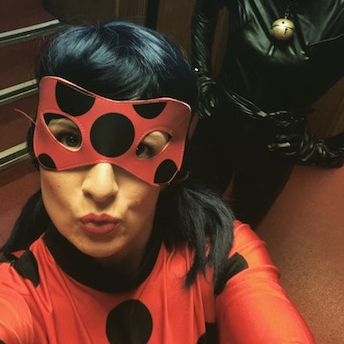 Together with Cat Noir your guests will be trained in the latest crime fighting moves, through an exciting array or superhero training, themed games, music and dancing. We’ve officially partnered with Children with Cancer UK and will be donating £1.00 of every booking to help fight this incredibly important cause. Together we can unite people to fight the injustice of cancer in children. What happens at your party? 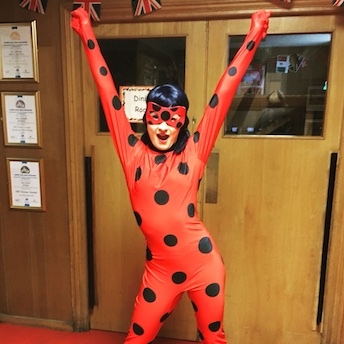 Your Miraculous Ladybug party entertainer will arrive fully equipped with music, games, balloons and prizes! Everything you need to have an unforgettable party. Your entertainer will also arrive approximately 30minutes before your party to setup and get ready. She’ll also contact you the week of your party, so you’ll get to speak with her directly too. We always tailor our party games to the age group and space available and will always make sure everyone’s involved. There will be superhero training, musical statues, pass the parcel, fun with the 3m parachute and our Miraculous catapult! Whilst everyone breaks for some tasty lunch your entertainer will continue interacting with all the children, applying mini face paints or glitter tattoos. No party is complete without music, and your Miraculous Ladybug party will be no exception. Expect lots of musical games, dancing and singing. Finally, just before your party comes to an end, there’ll be time to cut the birthday cake and for everyone to make a very special birthday WISH with our magic dust. The entire team at Especially For You parties will work as hard as we can to ensure that your child’s birthday party is nothing short of perfect.View our testimonials to see what other people thought about their Especially For You parties, and book your party today! Locations: We provide parties all across the UK, including: London, Kent, Surrey, Essex, Berkshire, Buckinghamshire, Bristol, Hampshire, Manchester, Leeds, Birmingham, Coventry, Leicestershire, South Wales, Southampton and Bournemouth. Visit our location page to find out more. Disclaimer: We do not wish to violate or infringe upon any copyright laws. We DO NOT claim to be associated with any copyrighted or name brand character. Our characters come from Storybook fables that have been around longer than Disney. Resemblances between our entertainers and the copyrighted characters is not intentional, and is purely incidental. All clients booking us must be in acceptance that our characters are not representing licensed copyrighted characters or their stories.